AllegroMedical.com presents The Silent Call Sidekick Receiver Deluxe Notification Kit with Wireless Doorbell. This multi-notification system notifies you to the doorbell, telephone and when the smoke detector has become activated. It plugs into a wall outlet and features a flashing strobe light and indicator lights on the Sidekick Receiver unit. 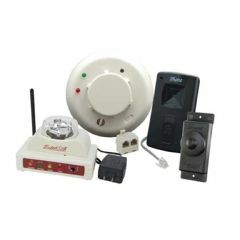 System includes Sidekick Receiver, telephone transmitter, wireless doorbell transmitter and smoke detector. Five year warranty for phone and doorbell transmitters. Combination three and five year warranty for smoke detector. This is a complete system that includes all the items necessary for notification.